"Plaid" or in our "plaid" - a quilt or blanket tightly woven wool or wool blend often. Country of origin plaid believe Scotland because of its traditional colors - in a cage. After all, the national Scottish clothing kilt and was thus a blanket worn around the waist. Let's think, what feelings we're having in the pronunciation of the word "blanket"? This is something soft, cozy, warm and comfortable. Plaid - Is not only convenient thing for the house, but also an accessory for long trips and even picnics and evening relaxing in outdoor cafes. As you may have guessed, our today's talk will focus on the blanket, and they have a huge number of IKEA. In order for us to understand them, to distribute them on a variety of tissues. 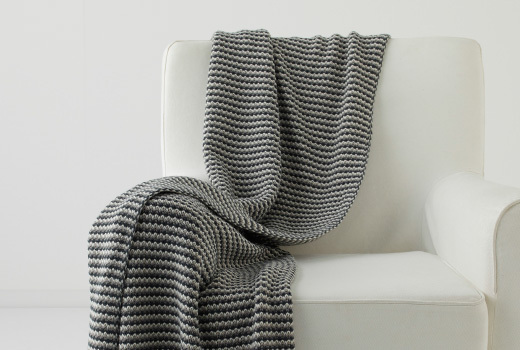 Let's start with the 'classics of the genre' '- Hermine - A wool blankets and acrylic, which is durable and soft. Dimensions Hermine - 180 * 120 cm. The collection is presented in two colors: beige, pink and beige and brown. Hermine easy to care for: machine wash at 30 degrees and pat plaid with average temperatures. 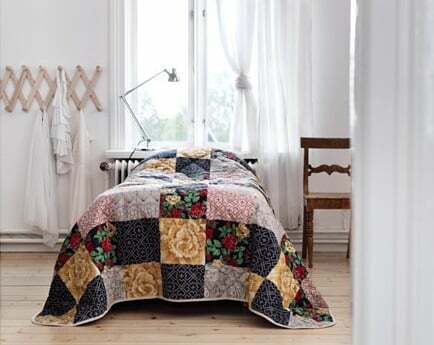 Also contains wool and plaid '' old '' good collection IKEA - STOCKHOLM (In beige color, size 170 * 130 cm), in the development of models that participated designer Maria Vinka. Its membership includes not only wool (18%), but also with silk mohair glitter, acrylic and polyester. This plaid recommended only hand wash in cold water, with 30 degrees, in order to avoid deformation. Bleach, dry mechanically and iron it is also impossible. Allowed to dry cleaning. White plaid Ophelia at the tender design by designer Charlotte Skak and combinations of wool, acrylic and polyester gives it softness and strength. The advantage of this series plaid is that it can be combined with other products in the Ophelia: linens and pillows. Erase Ophelia in a washing machine at 30 degrees and the delicate washing. Dimensions plaid suit for the big bed - 170 * 130 see. RYUSSBI 2014 - Plaid natural color with a fairly high content of wool (77%, nylon - 23%) in the warm evening coolness and provide good insulation and comfort. Dirt repellent plaid ensure its durability. Recommended delicate cycle and dry cleaning. This beautiful, light and warm blanket decorate a double bed, its size is really impressive - 150 * 200 see. We have identified the following categories of rugs 100% polyester. First present to your attention plaid POLARVIDE (170 * 130 cm), presented in a variety of colors: white, red, orange, classic green, red and purple flowers. Polyester easy care, machine washable at 40 degrees, but, of course, forbidden whitening, dry cleaning and POLARVIDE can not be ironed. 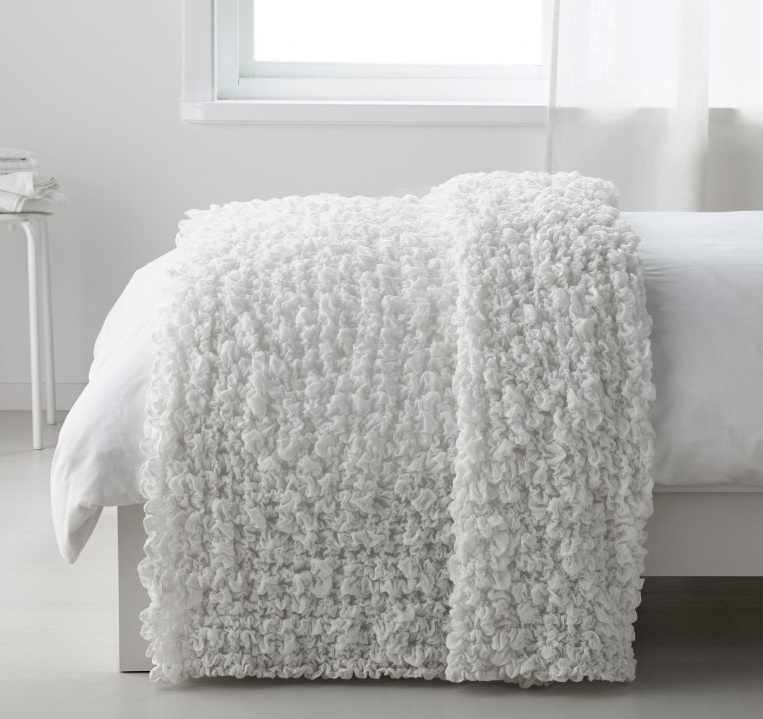 At the touch of this fleece blanket is very soft and pleasant. As regards environmental material from which is made POLARVIDE, it has the ability to be recycled. KROKRIS - Another model of plaid 100% polyester (160 * 130 cm), developed by the designer Paulin Machado and executed in white with gray color. This fleece blanket is pleasant to the touch and has no special requirements for care, other than machine washable at 40 degrees. Lindbom - Bright and colorful polyester (100%) in Figure plaid white zigzag complements any interior. Size Lindbom - 180 * 120 cm. Designer Niina Aalto warmly tells of the creation of this lively and expressive plaid. Speaking of love for drawing and creativity, she emphasizes that the graphic quality of black lines on the fabric deliberately softened warm and vivid colors. Plaid turned out simple, but at the same, as an unusual and original piece of furniture. 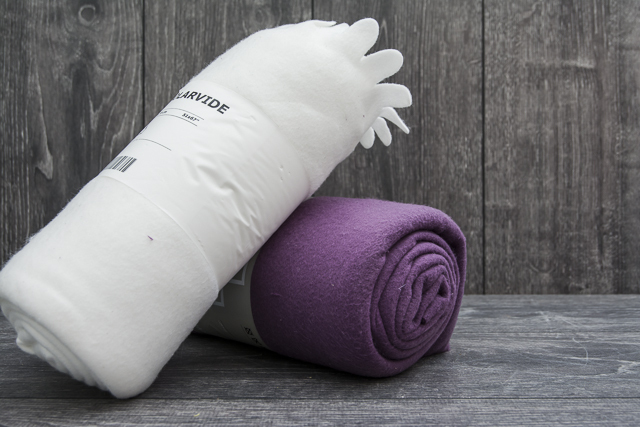 Separately in this category fleece blankets from 100% polyester is baby blanket VENNERNA in lilac and black colors. 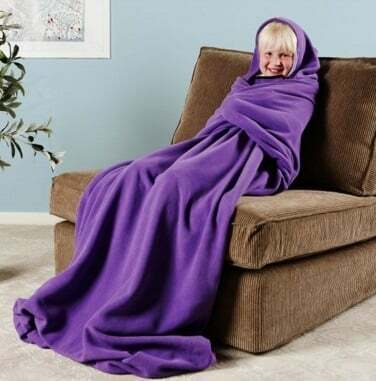 This is not an ordinary blanket or blanket, but with a hood, designed specifically for children in order to create warmth and comfort. Can be combined with the rest of the series. Gently wash WENNERN, observing all the requirements specified by the manufacturer, considering the possible shrinkage to 4%. The fabric of the blanket WENNERNA has undergone a special treatment, which ensures its smoothness and softness. VENNERNA can be used at home, either on the road or on a visit. Designers Julia Bernholtz and Helena Svensson invested a lot of energy and love in their creation, turning to the design of textiles for music, fashion and modern developments, which allowed to find expressive and amusing details. They developed a single concept and a soft blanket with an unusual and original ornament turned out to be a worthy copy of the collection of comfortable textiles. 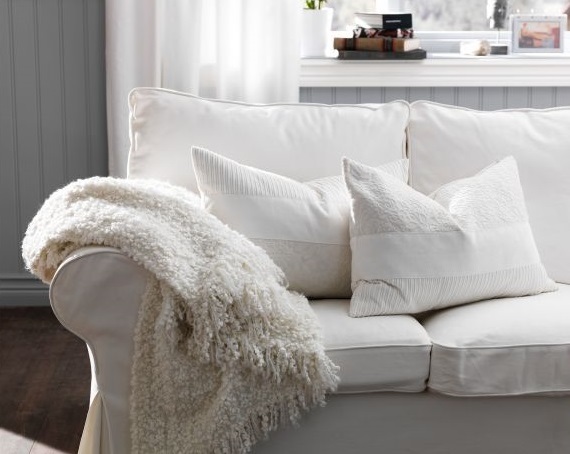 For lovers of natural and fully renewable materials IKEA offers plaid Ursula in two colors: white and beige. It is known that natural ingredients are very capricious in care, carefully follow the requirements specified on the package plaid, since it is made of 100% cotton and may shrink up to 6%. This factor should be taken into account when choosing the size of the rug. The original size of Ursula - 180 * 120 see. The next category - acrylic blankets. Here we put plaids Henrik (100% acrylic) - 180 * 120 see, in a variety of colors: dark orange, black, light beige, light brown and purple flowers; Gourley (Acrylic - 70%, the rest - Polyester) - 120 * 180 cm, available in brown, white and beige colors, and a combination of gray and black, cyan and blue, red and pink; ORMHASSEL (120 * 180 cm) - plaid gray of 100% acrylic, designed by designer Kazuyo Nomura; Eyvori - Small 100% acrylic rug - size 125 * 170 see in black and white color. 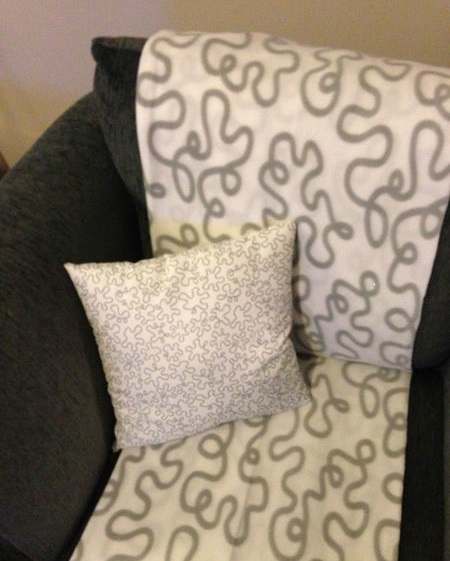 Do not forget that, as a rule, acrylic and acrylic products with content tend to shrink in the above models of acrylic fabric shrinkage can reach 4% to 6%.